Michigan became a Right to Work state in 2012. Wisconsin banned teacher bargaining the previous year and just adopted its own Right to Work law. What’s it like to teach in Texas, where collective bargaining has been prohibited by law for many years? It turns out having a union to bargain for you makes a very big difference, including how much you make. 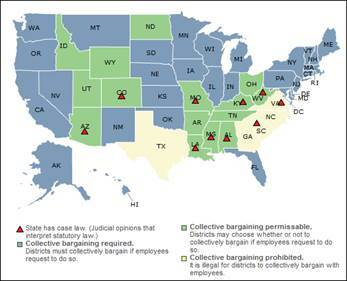 Bargaining is outlawed in just 5 states (Texas, Georgia, North and South Carolina and Virginia), but is ‘permissive’ in many more. That means management can bargain if it wants to. Imagine how that turns out. 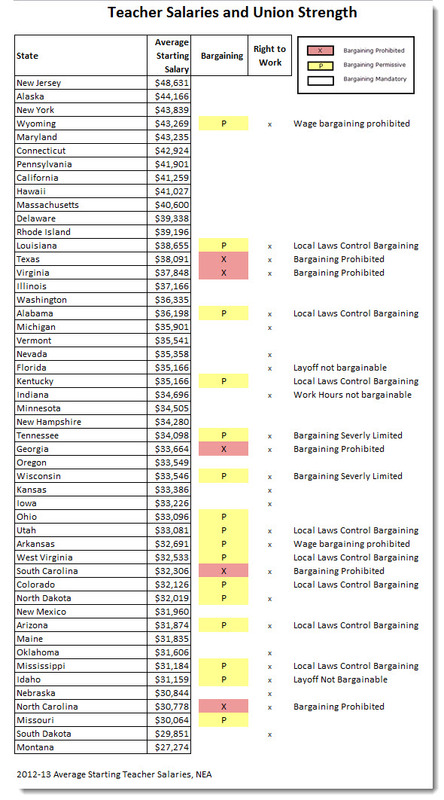 To make that decision easier, most of those states also restrict bargaining in various ways. Some of these states have also imposed Right to Work laws, some haven’t. The result is a complicated and uneven environment in which unions represent their members. But what’s the effect on teacher wages? Higher teacher salaries are much more common in states that don’t suppress union strength. Other factors, no doubt, impact these salaries, cost of living, for one and how long these various laws have been in effect, for another. But the advantage of advocating together for better pay is pretty clear. But after all, that’s just common sense. ← Mackinac Center Turns to Focus Groups: What Should We Have Said? ?